Experience the Queensland Sugar Industry first-hand and visit Australia's only unique miniature working sugar mill and distillery. Showcased at the Sarina Sugar Shed, bring along the whole family for a fun and educational tour of this award winning tourist facility. See firsthand how sugar is grown, processed, milled and distilled in the unique miniature mill. 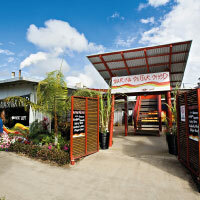 Experience the tasting of the products produced at the Sugar Shed including liqueurs, schnapps and gourmet sauces. The big attraction for all ages is the creation of fairy floss. Tours run at 9.30am, 11am, 12.30pm and 2pm.